If you haven't heard, GoGoGrandparent has an online user dashboard. 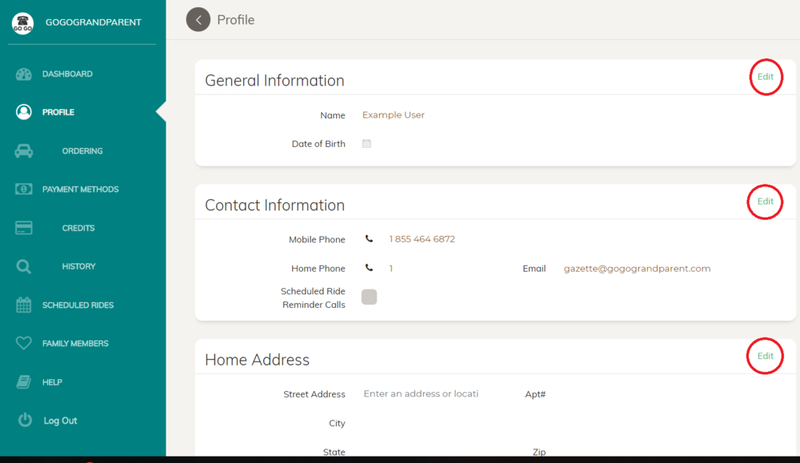 This dashboard will be useful for our callers and family members to view and change user information. Login in by clicking the link app.gogograndparent.com/login. Use your email associated with your GoGo account and click "Forgot your password?" if you haven't set a password yet. Below we'll go over some of the features included in the dashboard. Having the most up-to-date information is key to having a smooth GoGo experience. If things change, you can update over the phone with our operators or online using the dashboard. This is how it will look if you want to update your information online. If you add a family member as a contact, we notify them via text messages with details of your ride. This includes driver information, a live ride map, and a confirmation when you arrive. This acts as an extra layer of security to ensure somebody you trust knows where you are at all times. Gold members can add up to four additional family members to a profile. Once you log into your profile, scheduling a request is easy! A request for a Transportation Network Company driver to come to your address is just a few clicks away. Follow these steps and you'll get going in no time. We still have the option of ordering through our phone number anytime. Reach us at (855) 464-6872. This is just another option for those interested. Our operators are happy to assist 24/7.